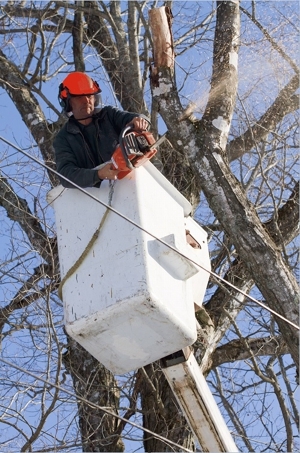 SkyHook Tree has been providing a complete range of tree services throughout the Boston area since 2000. At SkyHook Tree we are passionate about properly managing tree health and safely coordinating trimming and removal when the situation calls for it. As a full service outfit, we offer everything from trimming and pruning, to tree removal and stump grinding, all the way to total lot clearing. No job is too heavy or too tall for SkyHook Tree, and we are ready to mobilize quickly at any time of day for 24/7 emergency tree service. In order to encourage a healthy tree population, it is important to manage tree health. Tree diseases can spread very quickly if they are not properly assessed and addressed. Damage from storms can also worsen a tree's condition if ignored. It is easy to become overwhelmed with your tree maintenance without the correct knowledge and maintenance. SkyHook Tree is a complete and comprehensive tree service for both homes and businesses. Call SkyHook Tree to get a FREE quote on any of the services we provide. The best tree service in the Boston area is at (774) 293-4173.